Task: Replace a traditional mechanical guide slide with a CNC to create an incredibly versatile and technically advanced knife slotter. Solution: Use a FANUC model 31iB CNC to provide a highly precise and entirely electronic guidance system on the machine. Result: The advanced level of control provided by the 31iB has helped CLC develop one of the most flexible and productive gear-cutters in the world. The advanced control functions present on the CNC FANUC 3 1uB have helped CLC make one of the most flexible and productive gear-cutters in the world thanks to the use of the electronic slide that makes it possible to also achieve helical teeth with great productivity. There aren't many manufacturers of hobbing systems or gear production in the world. This for a very simple reason. Because it is one of the most difficult processes in the field of chip removal, for which there is a need to combine great precision, with regards to the creation of the desired profile, to a high productivity and flexibility of use. In fact, there are many different types, shapes and sizes of teeth required for mechanical transmission systems. In any case, the gear is most often one of the most critical components because the performance of the final product depends on it. Therefore, the market quality required is always of the highest level. The case of Emilia Romagna's CLC company is practically unique on the international market, since it's one of the very few realities worldwide who is able to offer all types of machines to make teeth: creator gear-cutters with horizontal and vertical axes, knife slotters and adjustments for gears and screws without ends. Founded in Italy over 30 years ago as a company specialized in retrofitting, it then evolved into a manufacturer of machine tools for the gear sector and has continued to do so for over 20 years. Thanks to this activity, it gained considerable notoriety, first on the Italian market and then abroad. Even though it competes with big multinationals, it has been very successful and this success has grown, leading it to acquire many important orders in Europe and Asia, which have pushed it to expand its presence on the American market and to expand its production facilities, which now occupy an area of more than 6,000 square meters. The added value of flexibility. As the founder Roberto Cervi tells us "one CLC's of strong points has always been the flexibility. We do not limit ourselves to making only one type of machine for a given gear processing. Over time, we have achieved the full range of solutions needed to better address the needs of those who make teeth and gears; from the typical mass/serial production of the automotive sector to the production of small-medium batches with a high rate of variability typical of the specialized workshops of third parties. In this regard, we offer all the main "platforms" for teeth processing, from creator gear-cutters to knife slotters, which are customizable with many accessories and variants and that are made to help our customers become more productive and flexible." The range of the dimensions that can be processed wih the CLC machines is very broad and goes from diameters of 100 mm to 2000 mm for the vertical axis machines and with modules of up to 30 mm, while for the horizontal axis machines, pieces with a diameter of up to 500 mm and a length of up to 3000 mm can be processed. Cervi explains: "The objective to make flexible and highly performant machines led us to focus on technological excellence in terms of the mechanical characteristics of our machine tools, but also in terms of their electronic automation. For example, we are one of the few manufacturers who can provide customers whit a complete work station with automated systems and automatic piece loading and unloading systems. We want to be the only ones people turn to by offering all our skills and experience to the gearing sector. For example, our machines were designed to be easily combined to anthropomorphic robots and other automated handling systems for pieces and accessories. In this context, FANUC's collaboration has been really successful. In addition to the CNCs, it supplied us with its anthropomorphic robots on various occasions and we integrated them with our machines to make highly productive and flexible workstations. Furthermore, also being able to offer FANUC's automation package enabled us to offer an alternative to our customers that is much appreciated in different sectors of the market and that consists in approaching different applications in a very competitive manner." One of the newest innovative and most technically advanced machines made by CLC is the knife slotter model CLC 200-SZ with electronic guidance. The particularity of this universal machine used to make teeth with a maximum diameter of 250 mm and a useful length of 100 mm is due to the adoption of a high precision and entirely electronic guidance system, rather than the traditional mechanical guide slide. "Having replaced the expensive mechanical slide with a rod and crank mechanism that is directly controlled by CNC also enables us to process helical teeth with great flexibility and lower operating costs. Indeed, customers no longer need mechanical slides that are customized for every type of teeth that need to be achieved. This makes it possible to eliminate the significant cost of the slide itself, but also the few hours needed to assemble and reassemble it every time the type of processing changes. The electronic controlled guide present on our knife slotter is universal. With the simple guided parameter settings on the screen of the CNC, the operator can change the type of process almost instantaneously. All, however, without suffering any loss of overall productivity. The processing speed of the machine, which reaches 750 knife strokes a minute for the helical gears, is almost as fast as the one of the fastest specialized and single use machines. Our CLC 200-SZ is therefore a truly universal machine, especially perfect for the needs of third parties who frequently have to change the type of production. It can indeed teeth gears, shafts, bars, cones or helical elements and with multiple phase cuts amongst them. It can be equipped with our vast range of equipment and optional accessories, such as the electronic phase setter, the deburring tool, the double-headed tool and many more". 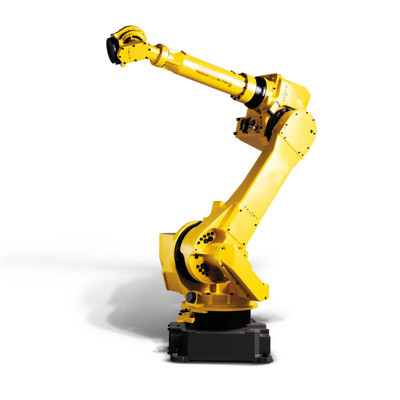 The electronic control system is based on the most modern functions present on the FANUC CNC; in this case, the model 31iB can be combined to an anthropomorphic robot for the automatic loading and unloading, typically the model M-710iC/50. "The fact that CNC and robots "speak the same language" offers two clear advantages", comments Cervi. "On one hand, it makes it easier for manufacturers to interface with the two control systems. For the end customer, however, it allows him to use either the control panel of the CNC or the one of the robot to interact with the machine. This is a great and practical advantage, especially when the structure of the machine prevents the comfortable viewing of the entire work area." A machine like the knife slotter CLC 200-SZ is a concentration of technologies that results from the 30 years of experience the manufacturer has acquired in the gearing sector; with the huge amount of research and development in terms of numerical controllers done by this main worldwide manufacturer. In order to optimize the electronic control system of the CLC 200-SZ slotter, the designers of this company from the Emilia Romagna region closely worked with the technicians of FANUC's Italian branch; that involved Japanese research labs and development specialists to define some of the specific functions needed to achieve maximum performance with regards to the precision of the teeth profiles. 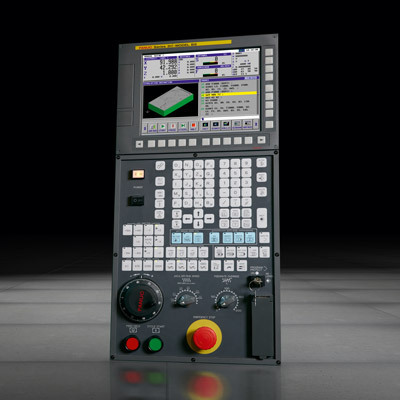 The technological heart of FANUC's solution is the combination between the execution of a high speed profile via the AICC II function and the learning function through which the CNC 31iB makes high speed profiles aimed to compensate for any profile residual error using artificial intelligence algorithms developed and owned by FANUC. Then, high performance and speed axis control cards were used and all the typical functions already present on FANUC's CNCs to manage the gear-cutters, such as EGB (Electronic Gearbox) and Flexible Synchronous Control to synchronize the various axes amongst themselves. Furthermore, the CLC designers, in collaboration with the local FANUC structure, have implemented a graphical interface for the Panel i display that allows operators to easily program the machine and to make the typical profiles of the electronic guide in a simple and immediate manner; of course, it would remain accessible also from the control panel of the robot via the direct connection between the two systems by exploiting the network connection via the Ethernet/IP protocol. Cervi concludes: "Our appreciation for the way FANUC works goes way back thanks to the direct relationship we have established and to its availability, which ensures speedy solutions for our specific needs. It's a bit as if we all worked for the same company and we approach our customers in the same way. Indeed, they appreciate this and have demonstrated their level of satisfaction by coming back to pick our solutions every time there is an opportunity to do so."